The Plate Setter (ConvEGGtor) is used for indirect cooking on the Big Green Egg. 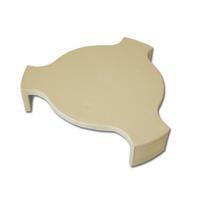 It is a ceramic heat shield that functions by providing a barrier between the food and the fire. The design of the Plate Setter (a flat ceramic disc with three "legs") allows sufficient airflow around the surface while preventing the flames and direct heat of the fire from reaching the food. Nothing will contribute greater versatility to your outdoor cooking than adding a Plate Setter to your accessories collection. Big Green Egg does not allow any online sales, please contact (580) 745-9306 or visit our store.